Mexican wedding favors can help to make turn your special day into something even more fun and festive. 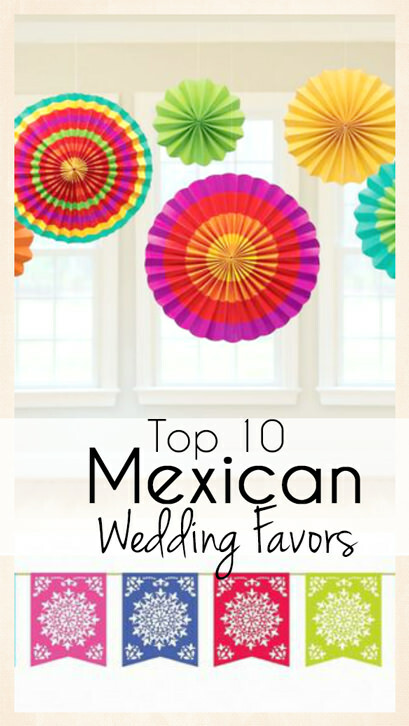 Whether you want to celebrate your Mexican heritage and culture at your wedding or you are enjoying a location wedding in Mexico, you need fun Mexican wedding favors to create a festive atmosphere at the reception. The great thing about this wedding theme is that many of the best favors easily double as decorations. This will save you tons of time and money as you plan your big day. Mexico is a colorful, lively place full of beauty. These 11 featured wedding favors will help you bring that excitement to your wedding. It’s time to create magical memories for you and every guest who takes the time to celebrate with you. 1. 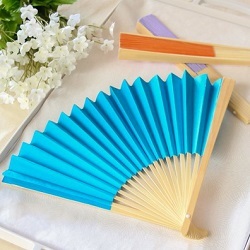 Colored Paper Fans -This is one of the most affordable and versatile Mexican wedding favors available. You can select from nine different colors and purchase them in bulk for less than $2 each. If you buy enough of them, they will cost you less than $1 each. These are easily hung from the wall to add to your overall decorative design, and they are fun to hand out to your guests. You can even incorporate them into the entertainment so that your guests are encouraged to open them up and wave them in the air while dancing. 2. 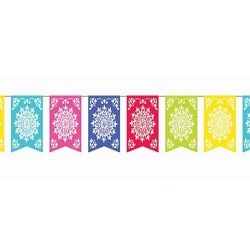 Plastic Mexican Cutout Banner -String this colorful banner up along a wall or over a long entrance to instantly add that Mexican flair to your reception. Each banner is 100 feet long, and they are an affordable option for all wedding budgets. 3. 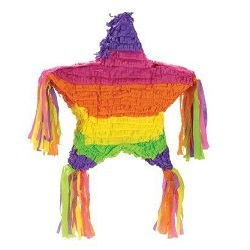 Rainbow Star Pinata -Do you have a lot of children coming to your wedding reception? Make it a family affair by stuffing this colorful piñata full of candy. Even adults will enjoy taking a swing to see if they can unleash the sweet goodness. If you want to go true Mexican style, stuff your piñata with authentic Mexican candies. 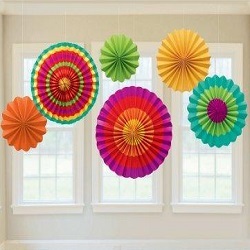 There are other styles of piñatas and colors to choose from as well. 4. 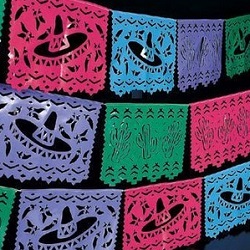 Mexican Papel Picado Border -Expect your guests to spend time staring at the wall or entrance way when you hang this 13-foot banner up for all to see. This is an authentic plastic border with intricate cutouts featuring birds, hearts and flowers. Spanish words are also spelled out to help celebrate your Mexican-themed wedding. 5. Fiesta Paper Fans - Hang these fans from the ceiling or on the walls in groups for beautiful Mexican style bursting with color. You get six fans in different sizes and colors in each package, so they are affordable as well as versatile. This is a decoration that your guests will want to take home at the end of the night, so they might double as favors. 6. 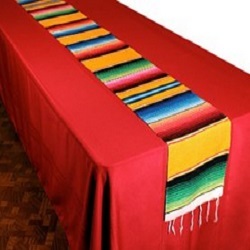 Mexican Table Runner -This colorful runner is 7’ long and is designed to go down the center of a long reception table. If you want to huddle all of your loved ones together and celebrate in true Mexican style, this is the perfect way to start your table arrangement plan. 7. Del Sol Plastic Flag Banner -Yes, another banner option! 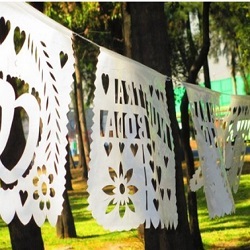 Banners are essential to authentic Mexican wedding celebrations, and this one is made from plastic so that you can reuse it at birthday parties or other weddings. The banner is 12’ long and features colorful plastic flags with intricate decorative cutouts. It is extremely affordable, so you can easily purchase more than one to hang along long walls or to string up between trees for an outside wedding. 8. Flower Hair Clips -No guest should outshine the bride on her big day, but you do want every guest to feel beautiful as they celebrate. 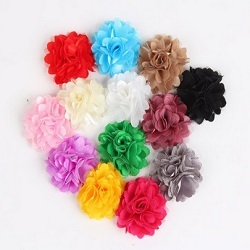 These mini hair clips feature handmade satin mesh flowers, and they come in many different colors. Spread them out on the tables and allow your guests to wear them during the reception. You may even want to pass them out at the door to the ceremony, creating instant color in the room as the bride walks the aisle. 9. 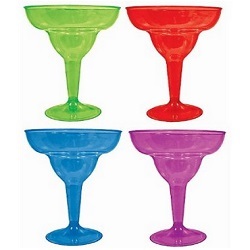 Colorful Margarita Glasses -How can you live it up and celebrate without a margarita or another mixed drink? These colorful glasses are fun and festive, so they will fit your Mexican wedding theme perfectly. 10. 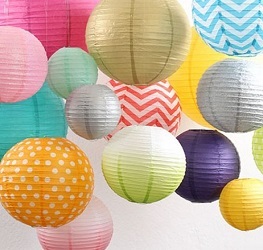 Round Paper Lanterns -You can find paper lanterns in many different styles, colors and sizes. They are the perfect decoration for any authentic Mexican wedding, and your guests may line up to take them home as favors.